While a student at the Kingswood School on the campus of the Cranbrook Educational Community in Bloomfield Hills, Michigan, Florence Schust became a protegée of Eero Saarinen. She studied architecture at Cranbrook, the Architectural Association in London and the Armour Institute (Illinois Institute of Technology in Chicago). She worked briefly for Walter Gropius, Marcel Breuer and Wallace K. Harrison. In 1946, she became a full business and design partner and married Hans Knoll, after which they formed Knoll Associates. She was at once a champion of world-class architects and designers and an exceptional architect in her own right. As a pioneer of the Knoll Planning Unit, she revolutionized interior space planning. 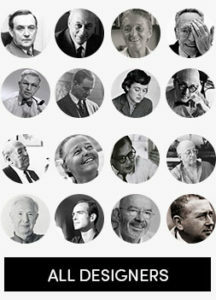 Her belief in “total design” – embracing architecture, manufacturing, interior design, textiles, graphics, advertising and presentation – and her application of design principles in solving space problems were radical departures from the standard practice in the 1950s, but were quickly adopted and remain widely used today. For her extraordinary contributions to architecture and design, Florence Knoll was accorded the National Endowment for the Arts’ prestigious 2002 National Medal of Arts.